Judi Bari Revisited: New Film Exposes FBI Coverup of 1990 Car Bombing of California Environmentalist | Democracy Now! longtime Earth First! activist and producer of the new documentary, Who Bombed Judi Bari? It plays tonight and tomorrow in Santa Monica, California. For a full schedule, visit the film’s website, WhoBombed JudiBari.com. Watch: "Oakland & FBI Agree Not to Appeal Judi Bari & Darryl Cherney Bombing Decision"
1996 Interview With Judi Bari on Democracy Now! 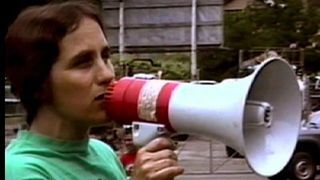 AMY GOODMAN: We end today’s show with a look at a new film about a legendary activist, Judi Bari, a union organizer when she came to California and got involved with the movement to stop the clearcutting of old-growth redwood trees. She helped organize a campaign called Redwood Summer to bring thousands of activists to join the fight. But in 1990, a pipe bomb blew up in her car when she stopped at a stop sign in Oakland, California, en route to a demonstration. This Judi Bari in an excerpt from a new film that looks back at the attack. JUDI BARI: I was driving my car, and I was driving down the street, and I was following somebody. At a certain point, I think she was getting ready to make a turn, and I was trying to follow her and realized I wasn’t going right. And I quickly hit the brake. And at time the time when I hit the brake, there was a very huge explosion, and I felt it rip through me, the explosion being so powerful that the sound itself had a force. KEN RICH: I was amazed. I mean, I’ve been in Vietnam. I’ve seen bombed vehicles. And I was amazed. When I first looked at that car, I couldn’t see a driver. ATTORNEY: What happened next that you can recall? JUDI BARI: The next thing I remember, the car was stopped, and there were people around. And I was in incredible pain that I had never felt before. I knew my back was broken. My legs both were both immobile at the time. I knew that my body was ruined. I knew that I was paralyzed. I felt that I was dying. REPORTER: The driver was identified as 40-year-old Judi Bari, also of Ukiah. Both victims were members of the environmental group Earth First! Both were taken to nearby Highland Hospital. The passenger was taken out first. ATTORNEY: Was someone in the car with you when the explosion occurred? JUDI BARI: Yes, Darryl Cherney was riding in the passenger seat. AMY GOODMAN: After the incident, Judi Bari and her passenger, Darryl Cherney, both with the environmental group Earth First!, were charged with transporting explosives themselves. In the end, the charges were never pursued. And to this day, the question remains: who bombed Judi Bari? That’s also the title of a new documentary that played last night in Oakland and screens today on Los Angeles at the Monica Laemmle Theater. We’re joined now by its producer. That’s right, the passenger in the car, Darryl Cherney. Darryl, describe that moment when the bomb went off, the role of the FBI in accusing the two of you of basically bombing yourselves, and why you’ve produced this film. DARRYL CHERNEY: Well, the world was pretty much turned upside down. My head was ringing. Judi was calling out in pain. I just kept telling her I loved her and that she was going to live. I was taken to the hospital, where the FBI walked in and just said to me, “This was your bomb, so why don’t you confess, make it easy on all of us, and get it over with?” And it was at that moment I thought of Leonard Peltier of the American Indian Movement and Geronimo ji-Jaga Pratt of the Black Panthers and realized that the FBI had now turned its attention, its COINTELPRO operation, toward Earth First! That was back in 1990. AMY GOODMAN: Talk about the legal case that went forward from there. Judi has since died, though she didn’t die then. She died of cancer. Talk about what has happened since that time. We’re talking about 20 years ago. You’re still in court. DARRYL CHERNEY: Well, Judi Bari and I sued the FBI primarily for violations of the First Amendment, that they deliberately and knowingly lied, that they knew we were innocent, but they lied and said we were guilty in order to shut us up. That is, in fact, a violation of the First Amendment. The lawsuit dragged on for 12 years because the FBI kept appealing different things. In the process, Judi Bari passed away from cancer after living her last seven years in pretty serious pain. But her lawyers, her estate and myself took them to trial in Oakland in 2002. And a jury, after hearing six weeks of pretty unbelievable testimony, literally unbelievable testimony from the FBI and the Oakland police, awarded us $4.4 million. AMY GOODMAN: So, when the FBI set their sights on the two of you, they stopped looking around. Who do you think—and what evidence has come forward to suggest who did this? And what was this bomb in your car? DARRYL CHERNEY: Well, we know that the FBI held a bomb school just 30 days before we were bombed. They were blowing up cars in Eureka, California, where I live, or near where I live. And they were doing it on a Louisiana-Pacific Lumber Company clearcut. Two weeks after that, a bomb went off at a Louisiana-Pacific sawmill, that eventually they tried to pin that on Judi and myself, too. And then two weeks after the sawmill was bombed, Judi Bari’s car was bombed by the exact same bomber, who took credit for this in a letter that was sent to the newspapers. So, there seems to be a thread between the lumber companies and the FBI, and then all the way to the bombed car. We are now in court to try to get the first bomb, that didn’t go off quite well—not the one in Judi’s car, but the one at the lumber mill. We believe there’s DNA evidence on that. There’s about six feet of duct tape that remains on that bomb. We think there could be fingerprints, duct tape hair samples. And as part of getting our money, we took less money, but in exchange for that, we demanded the evidence be returned to us. The FBI is now appealing that, saying they don’t want to turn over those bomb remnants to a independent forensics laboratory. We’re trying to get a DNA sample to see if we can identify who the bomber is. AMY GOODMAN: The letter was from the “Lord’s Avenger,” and the bomb was placed under Judi’s seat, the driver’s seat, a very unlikely place if you had put it there yourselves? DARRYL CHERNEY: The bomb itself had a motion trigger. It was only going to go off in a moving car. It was placed underneath Judi’s seat. It was designed to kill her, only when the car was moving. So she had to be in the vehicle for the bomb to go off. It was so obvious. The police knew that at the time. They found the ball bearing that had to roll around and touch a positive and negative wire for the bomb to explode. So—and they even wrote “booby trap” on the first police reports. So they knew it was a victim-operated device, and yet they blamed us pretty much instantaneously. AMY GOODMAN: Darryl, we’re going to continue this discussion after the show, and we’ll post it online at democracynow.org, so please stay seated. Darryl Cherney, producer of the new documentary, Who Bombed Judi Bari?, which is airing today in Los Angeles.